Chris Hunt, creator of PilatesEVO. Since its birth around 100 years ago, the Pilates method has been modified and arguably made more effective by some distinguished presenters, but diluted and the basic principles largely ignored by less scrupulous teachers. Pilates EVO©(EVO is an abbreviation of evolution) is like no other Pilates system you have ever known. Developed by Chris Hunt Pilates in London, it takes Pilates in a new and exciting direction incorporating more functional training methods and movement patterns, whilst staying true to traditional Pilates principles. Pilates EVO© expands the mind and body element of Pilates by incorporating Neuro-Linguistic Programming (NLP) and Mindfulness Meditation techniques to maximise the psychological and physical benefits, improving concentration and making clients emotionally, mentally and spiritually fitter. It improves motor fitness such as agility, balance, speed, co-ordination, reaction time and power. Pilates EVO© also draws on the thousands of years of teachings from Kundalini yoga and meridian stretches to impact energy flow and enhance the overall experience. It has more flow and movement with sequences of moves made up from the sacred numbers 3, 7 and 21, and it uses unique, uplifting soundtracks mixed in London by DJ Shameless to enable clients to really connect with how their body is moving and working, giving a far deeper and rewarding experience. Most moves have different levels progressing muscular fitness using repetitions, range of motion, rate and resistance. This creates a system that will remain challenging to a wide range of training goals from elite athletes, people seeking everyday fitness, to clients rehabilitating following accident or injury. This system increases muscular strength and endurance as well as flexibility, and helps prevent injury and improve performance with movements that are applicable to life and sport. Pilates EVO© is more than an exercise system, it is a way of life. A way to maximise your potential physically, mentally and emotionally. You can experience PilatesEVO© in Barcelona in May 2015. This event is organised by Barcelona Bienestar (www.barcelonabienestar.com), who organise fitness and sport holidays and wellness retreats all year in Barcelona and Ibiza, and personal training. Chris Hunt will be running 5 days of masterclasses and workshops from Monday 4th to Friday 8th May. You do not have to be a PilatesEVO© qualified teacher to attend, as all the information and training can be used by any Pilates or functional training teacher in standard Pilates sessions or in any type of functional training sessions. If you are an existing PilatesEVO© teacher you will learn new PilatesEVO© combinations. If you are new to the PilatesEVO© concept then you will gain a basic understanding of the system and ideas and moves you can use in your own Pilates sessions. This is the most popular PilatesEVO© course which is useful for any Pilates teacher. It gives invaluable information about how to correctly touch and guide people during a Pilates class, ensuring that your positioning, corrections and hands-on guidance give your clients the best possible learning experience. This module will teach you how to modify your Pilates exercises and sessions for all stages of pregnancy. This module will give you information on how you deal with some of the most common conditions that some of your clients will present with and how you can best help them to rehabilitate. Not all clients come to Pilates for rehabilitation. This exciting module gives you advanced movements for advanced clients. All qualified PilatesEVO© teachers (who have a minimum of the PilatesEVO© Foundation Course qualification) receive a discount of 20% on the above prices. Immediately following the training week, you can attend Pilates and Functional Training Carnival on the 9th and 10th May. This event is truly unique in the fitness industry as all profits are given to a local Children’s Charity, Fundació Pere Tarrés. There is a full weekend of classes from International Presenters and the only charge is a donation of 50€. This is not a typical convention full of egos and reputations. This is the people’s convention and it is a breath of fresh air. If you attend all 5 days of the PilatesEVO© training week then you get FREE entry to Pilates and Functional Training Carnival (Chris Hunt will donate your 50€)! All qualified PilatesEVO© teachers also receive free entry to the Carnival. 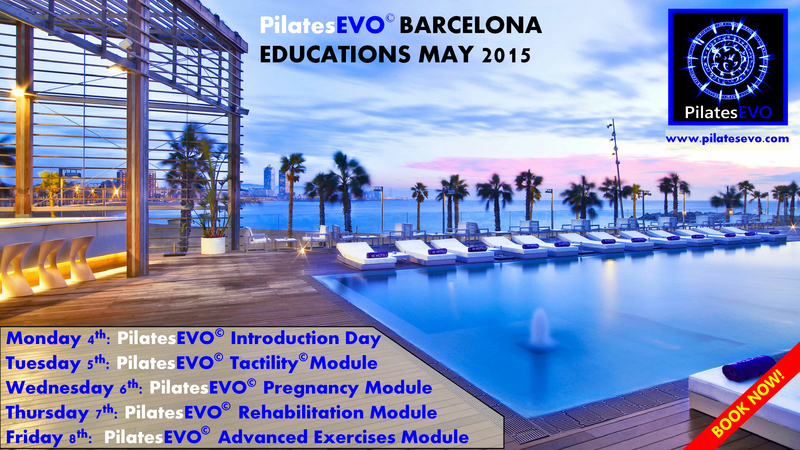 For more information on PilatesEVO© Barcelona 2015 training week and on Pilates & Functional Training Convention 2015, please contact chris@chrishuntpilates.com. Chris Hunt is an international Pilates and functional training presenter and educator based in London and Barcelona, Spain. He is the creator of Pilates EVO©, bodyFUNC©, and CEO of Pilates Rehab Limited and Sport Core Strength. He also created Pilates Carnival and Fitness Carnival, conventions where all profits go to local children’s charities. He organises Pilates events, retreats, fitness holidays and sports holidays in Barcelona and Ibiza. For more information about training with Chris in Barcelona, please click on Barcelona Bienestar. To learn more about Chris Hunt, please read Just who is Chris Hunt anyway? You can also subscribe by completing the form on the this BLOG to receive articles and special offers straight to your inbox. Chris Hunt pays all profits made from this BLOG to his charity partners. More details can be found by clicking on www.chrishuntwellness.com and selecting the “charity partners” tab. Pilates, cowboys and horse riding: Perfect partners or a load of bull? It’s been a chilly week in Barcelona and London, although I know it’s all relative as some of you will be experiencing much colder temperatures. There were even some snow flurries today in Barcelona, which is probably contrary to what most people expect. Contrary thoughts and expectations are the theme of my blog today, along with of course Pilates. Two hours before he was scheduled to do battle with a 1,900-pound bull named Blurred, Matt Dunsmore was searching for bliss. 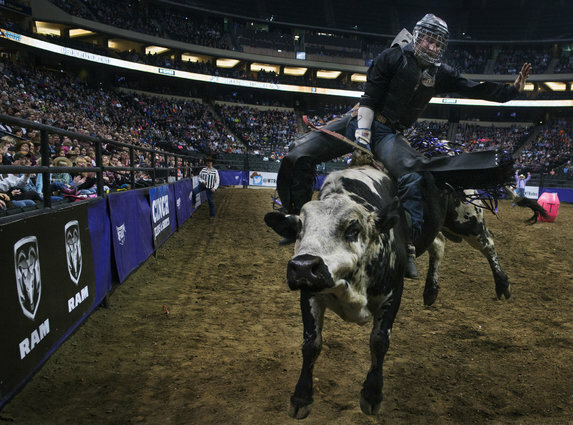 A professional bull rider from Elk River, Minn., Duns¬more was competing in the World’s Toughest Rodeo tour stop over the weekend at Xcel Energy Center in St. Paul. He found a quiet corner tucked underneath the stands, and there, amid the solitude, he went through his yoga routine. The yoga was a must, he explained later, because he had missed his Pilates class. We all know that Pilates can help strengthen the core muscles that riders use, and it will restore the body’s balance. Whilst Pilates helps with many sports and everyday life, the fact that its benefits include improved posture and muscle tone as well as increased stability for the pelvis and shoulders, makes it essential for the rider. Improved core stability will mean less work for the rider’s back and improved independent movement of limbs without unbalancing the torso. The rider’s I have worked with in the UK and in Barcelona and Ibiza on our Barcelona Bienestar horse-riding holidays learn to concentrate and to breathe more deeply which can help control their heart-rate, and their flexibility will also increase. They achieve better harmony with their horse, removing imbalances that are commonly transferred between the horse and rider. Their balance improves helping with jumping, as does their coordination and stamina. Pilates is also an excellent way to avoid common associated injuries such as shoulder and back pain, and groin strains, or to recover from injury more quickly. Most commons injuries are caused by falls or during stable duties. About 80% of injuries occur while riding, and these respond very well to Pilates as it improves balance and postural awareness which help to reduce the risk of falling. Pilates can also help to improve spatial awareness which means that the rider can react more quickly when faced with the unpredictability of their horse. 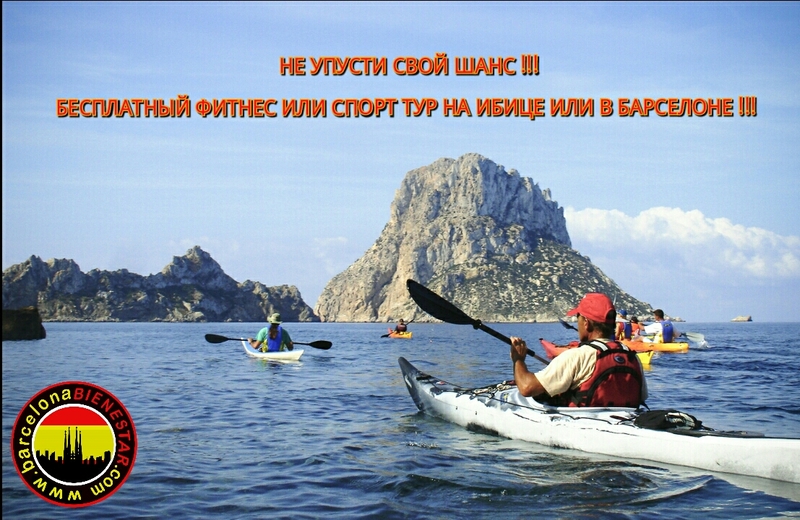 Ретрит, фитнесс и спорт туры в Барселоне и на острове Ибица! Бесплатные Ретрит, фитнесс и спорт туры в Барселоне и на острове Ибица! Ретрит, фитнесс или спорт тур в Барселоне или на о.Ибица бесплатно !? Определённо, в современном мире ничего не бывает задаром и сложно представить, как можно получить бесплатно что-то качественое и без обмана. Возможно! Barcelona Bienestar предлагает вам прекрасную возможность, приложив немного усилий, получить бесплатно фитнесс или спорт тур в Барселоне или на Ибице! Начнем со знакомства. Что такое Barcelona Bienestar? Что означает «bienestar»? В переводе с испанского «bienestar» – благосостояние. Устаревшее значение этого слова – хорошее физическое, душевное состояние и это именно то, что мы предлагаем людям из всех уголков мира. Компания Barcelona Bienestar, эксперты в организации ретрит, фитнесс и спорт туров в Барселоне и на Ибице. Barcelona Bienestar предлагает составление на заказ VIP-туров для клиентов со всего мира! Нашими услугами пользуются турасты из многих стран, включая Россию, США, Китай, Гернанию, Францию, Италию, Англию, Канаду, Бразилию, Латвию, Литву, Австралию и Тайланд. Почему? Ответ прост, все любят Барселону и обожают Ибицу! Что может быть лучше поездки на отдых в любимое место, которая будет включать в себя здоровье, фитнес и спорт! И так, что же мы предлагаем нашим клиентам? Да всё, что они захотят! Фитнес, спорт, рестораны, уютные загородные домики, ночные клубы, круизы на красивых яхтах. Мы говорим на Русском, Английском и Испанском языках. Barcelona Bienestar предлагает широкий спектр спортивных развлечений: серфинг, SUP-серф, сноуборд, катание на лыжах, горные велосипеды, кайт – серфинг, скалолазание, гольф, дайвинг, пешие прогулки и теннис. Если вы хотите освоить что-то новое для себя, мы обеспечим вам ежедневные спец тренировки и практические занятия по выбранному вами спорту. Mы помогаем нашим клиентам достичь поставленной цели и намеченных планов, будь то кардио фитнес, наращивание мышечной массы, коррекция и снижение веса. Проводя групповые и персональные тренировки мы используем различные техники для получения наилучших результатов. Пилатес, йога, бокс, табата, гири, TRX, HIIT, утяжеляющий желет, круговые тренировки и многое другое. Ваши тренировки могут проходить, как в помещении, так и на улице – пляжи, парки, горы и т.д. Выбирайте, что по душе и в любом количестве. В организации вашей поездки мы вам поможем на столько, на сколько это будет нужно. Ваша задача купить билет на самолёт, а все остальные организационные заботы мы возьмём на себя. Мы можем подобрать вам шикарный отель, коттедж или апартаменты в соответствии с вашим бюджетом. Barcelona Bienestar также предлагает: детокс программы и план питания, после ежедневных фитнес или спорт программ у вас будет достаточно времени на приключения, наслаждение и расслабление. Мы поможем взять в аренду машину или велосипед, расскажем о лучших пляжах и местах, которые стоит посетить, а также лучших ресторанах и дискотеках Барселоны и Ибицы. Мы знаем как работать, мы знаем как отдыхать. Чтобы запечетлеть прекрасные моменты вашего путешествия, у нас есть для вас фотограф. Для вас мы можем организовать экскурсии, записать вас на массаж или сеанс физиотерапии. Возможно всё! Даже по окончанию вашего путешествия по спорт или фитнесс програме в Барселоне или на Ибице, работа Barcelona Bienestar не заканчивается! Мы предлагаем онлайн программы, чтобы вы могли поддерживать полученый результат или продолжать работу над собой, сохранив хорошие привычки. И так, как же получить бесплатный тур? Очень просто! Первое, поставь Нравится/ Like и Поделись/ Share нашей FACEBOOK страницей или добавляйся в Друзья на VK и делись нашими постами. Мы смотрим! Второе. Если ты тренер или хозяин клуба, собери группу своих клиентов (минимум 8 человек) в один из туров Barcelona Bienestar в Барселону или на Ибицу и получи бесплатное место в этом туре! Если ты квалифицированный, опытный тренер мы можем включить тебя в программу тура и если нам понравится то, чем ты занимаешься, мы можем вновь пригласить тебя в Барселону или на Ибицу, как одного из наших тренеров. Если же ты не тренер, но преверженец здорового образа жизни и/или занимаешься спортом, собери группу друзей и единомышленников (минимум 8 человек), и наслаждайся выбраным вами туром в Барселолне или на Ибице бесплатно! Всё что тебе нужно, привези ссобой 8 или больше друзей и ты получишь свой тур БЕСПЛАТНО! Для этого специального предложения Barcelona Bienester в 2015 году у нас ограниченное количество свободных недель, по этому спешите связаться с нами чтобы обсудить детали и начать планировать тур вашей мечты. Твоё путешествие в Барселону или на Ибицу станет незабываемым! Помни, когда выбираешь Barcelona Bienestar, TODO ES POSIBLE! Поездка в отпуск для каждого из нас имеет своё значение. Кто-то отправляется на морской курорт, чтобы удобно расположившись на шезлонге, расслабиться на солнце. Другие предпочитают познавательные приключения. Для кого-то поездка в отпуск- это экскурсионные поездки по историческим и значемым местам, или экскурсии с гастрономическим акцентом, позволяющие погрузиться в другую культуру. Некоторые люди, приверженцы активного отдыха, предпочитают попробовать нечто новое – лыжи или сноуборд, горный велосипед, серфинг, пешие прогулки или проводить отпуск в основе которого лежит спорт и любимое хобби. Кому-то, возможно, нравится музыка и искусство – и это лежит в основе их отпуска. Так почему же отпуск в Барселоне идеальный выбор? А всё потому, что в Барселоне вы можете провести отпуск на любой вкус. Всё больше людей приходят к тому, чтобы организовать отдых согласно собственным предпочтениям и интересам. Дни традиционного отдыха по стандартным путёвкам уходят в прошлое, теперь люди используют интернет, чтобы планировать свои собственные уникальные путешествия. Некоторые люди предпочитают конструктивно организованный отпуск, но не желают участвовать в каких- либо стандартно организованных поездках при гостинице, которые, как считает руководство отеля, будут интересными и доступными для вас в указанное ими время согласно расписанию. Всё больше людей, планирующих поездку в отпуск, отдают предпочтение тому, чтобы все мероприятия и маршруты «на заказ» были составленны согласно их конкретным запросам и временным рамкам. Поэтому, Barcelona Bienestar, является отличным выбором и отвечает всем потребностям наших клиентов. Для нас нет ничего, что мы не сможем организовать для наших клиентов, которые приезжают к нам со всего мира. Барселона является таким разнообразным, многогранным и интересным городом, и Barcelona Bienestar дополняет это, предоставляя своим клиентам индивидуально подобранные маршруты, чтобы максимизировать пользу и наслаждение отпуском. Мы предлагаем оздоровительные и фитнес пакеты на основе того, что интересует наших клиентов. Фитнес мероприятия включают работу с персональным тренером: пилатес, TRX, бокс, утяжеляющий жилет, функциональный тренинг, HIIT, и программы, основанные на определенных видах спорта, таких как серфинг с веслом или SUP (Stand-up Paddling) фитнес, катание на лыжах / сноуборде, серфинг, прогулки, катание на горных велосипедах, скалолазание и многое другое. Для всех этих мероприятий, мы организуем время не только для обучения, но и даём возможность практиковать полученные навыки. Таким образом, вы прекрасно проведёте время, катаясь на доске для серфинга или лазая по склонам гор. Barcelona Bienestar предлагает вам не только физические нагрузки. Мы также предлагаем широкий спектр оздоровительных и косметических услуг, включая массаж, диету, программы по снижению веса, медитации, а также завивка и наращивание ресниц, гелевые ногти и гель-лак. Мы также организуем культурные программы и гастрономические экскурсии. Мы даем консультации по лучшим ресторанам и достопримечательностям Барселоны, которые стоит посетить. Barcelona Bienestar, берёт все заботы по организации Вашего отдыха, но вы всегда можете контролировать этот процесс, чтобы получить от поездки и проведённого отпуска всё, что вам нужно и всё о чём вы мечтали. Для получения дополнительной информации, нажмите на www.barcelonabienestar.com или свяжитесь с нами и дайте нам организовать отпуск Вашей мечты. Барселона ждет вас! Мы тоже! Преимущества тренировок с персональным фитнес-тренером. Существуют причины, по которым люди предпочитают пользоваться услугами персонального тренера, основными из которых являются более быстрые и простые пути улучшения здоровья и физического состояния. Компания Barcelona Bienestar предоставляет услуги персонального тренера и другие виды активного отдыха, но сегодня наша статья о приемуществах занятий с персональным фитнес тренером. Согласно опросам, основная причина обращения к услугам персонального тренера состоит в получении профессиональной помощи по: улучшению сердечно-сосудистой системы, коррекции осанки, развитию баланса и координации, гибкости, силы, выносливости, стабильности суставов, укрeплению мышечного корсета позвоночника. Конечно в этот перечень также входит достижение и поддержание оптимального веса тела. Снижение процента жира или увеличение мышечной массы, формирование фигуры и поддержание тонуса. Всё это может быть достигнуто с помощью квалифицированного (лучше всегда проверить квалификацию вашего тренера, потому что в некоторых естах, и в Барселоне тоже, много неквалифицированных людей пытаются предоставить тот или иной сервис) специалиста, который поможет вам поставить реалистичные цели и определит безопасную стратегию. Наряду с тренировочным процессом персональный тренер расскажет вам о правильном здоровом питании и составит план диеты, ведь как известно, диета или лучше назвать это – план питания, одна из основополагающих успешной динамики тренировочного процесса в целом. Правильное питание — верный шаг к успешному результату! Как показывает практика, следование плану, является самым сложным испытанием для тренирующегося. Задача персонального тренера создать все условия и наделить вас необходимой мотивацией для измения образа жизни с акцентом на здоровье и физическую активность. Персональный тренер еженедельно делает замеры объемов, отслеживает вес, корректирует питание и програму тренировок в зависимости от цели. Индивидуальный подход к каждому клиенту — основа работы персонального тренера. Разработка данного подхода имеет важное значение, так как все мы разные, со своими особенностями и ограничениями по здоровью. 70% наших клиентов в Барселоне пользующихся услугами персонального тренера имеют специфические медицинские проблемы: артрит, ожирение, остеохондроз, проблемы с позвоночником различного характера, а хороший специалист поможет вам добиться цели с учетом ваших индивидуальных особенностей и противопоказаний. Ваш персональный тренер может работать совместно со специалистом, ответственным за ваше физическое состояние, с целью разработки более эффективной тренировочной программы, позволяющей вам, в том числе, решить проблемы со здоровьем. Вы получите максимум результата за минимальное время, с помощью программы, разработанной именно для вас. Конечно же, помимо всего прочего, лучше всего мотивирует наличие человека, который возьмет под контроль и пройдет путь к достижению цели вместе с вами. Ещё один отличный мотивирующий момент к действиям без отговорок, это наличие обязательств перед кем-то, кто заинтересован в ваших результатах и оказывает личное внимание и поддержку. Сегодня услугами тренера пользуются люди разного уровня подготовки, возраста и достатка. Преимущества работы с персональным тренером настолько очевидны и эффективны, что получили широкое распространение и перестали быть предметом роскоши или закрытой услугой только для богатых и знаменитых. Вы — современный человек со своими возможностями, способностями, амбициями и мечтами. Персональный тренер поможет вам раскрыть свой потенциал. Начни свой путь к здоровью сегодня! Barcelona Bienestar предлагает спектр услуг включающий: персональные тренировки, фитнесс, кардио тренировки, Пилатес и массаж. As well as attending the PilatesEVO School in Barcelona and our worldwide educations, you can also study online! Are you a Pilates grunter?